There’s a thing called Stuff Portrait Friday which goes on over at Kristine’s Random and Odd. It has been awhile since I participated, but hey, my last Final is done and I really search for ideas to procrastinate doing housework. Although there are 6 loads of bedding from our room needing to be put through the cycles of the laundry machines. The current assignment: Something Red, Something Green, and Something that you Decorate. I looked up Decorate in the dictionary. It means ‘To furnish, provide, or adorn with something ornamental; embellish.’ There’s all kinds of things around here which serve no purpose other than to need dusting on a regular basis. I don’t do much of that activity, either. The Christmas extras aren’t being brought upstairs from the storeroom until maybe Sunday. When I was a kid, we didn’t do the special activities until school was out, and for our district that won’t be until December 21st. Days away, plenty of time. No decorations here today. You might go over to DoF’s blog and check out Husband’s picture of the neighbor’s lights. You came here for Stuff Portrait. Something Red is my Reindeer Shirt. Notice the embroidery, not the plump lady inside it. Such incentive to be losing the 50, yes 50, pounds the Nurse Practitioner is nagging me about. I bought this at a little kiosk in the mall the first Christmas I worked in the Baby Room at the daycare center. The stitching did not chafe soft little cheeks while I was rocking babies to sleep. Unlike the glitter glue and stiff iron-ons of my other sweatshirts. 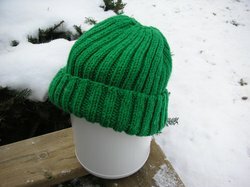 Something Green is this hand-knitted hat. It was given to me one Christmas from a grandma at the daycare center. I use it when I am shoveling snow, but truth be told, it is too big for me. By the time I get to the end of the sidewalk, this thing slides down far enough to touch the top of my glasses. I am thinking of donating it to the charity box at the public library. But then I worry that the grandma giver would spot it and believe I was an unworthy recipient. Catching up from something Susie had going earlier this week, I would also like to post these pictures. Reprints similar to this were sent out in Christmas cards in 2001, and we all remember what happened early in mid-September. I cannot believe that was 4 years ago already! All this baking was for a sale to benefit the Red Cross. The daycare center brought in a little over $600. One loaf of my Zucchini Nut Bread (bottom left) got a donation of $20. I about fainted that morning, let me tell ya! My famous Oatmeal Choco Chip cookies (recipe in a previous post, so scroll down) are at the end of the table closest to me. And I think Susie asked us to show something that I wear this time of year. 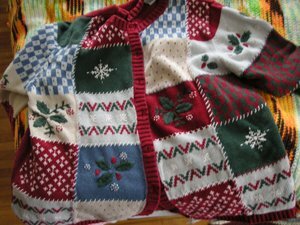 Here is my sweater of the season. I bought it at TARGET a couple years ago, at the After Christmas sale, of course. I don’t think I’ve worn it a dozen times yet. 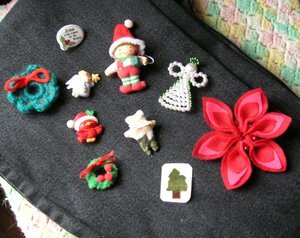 Wrapping up this little session is a photo of most my Holiday Pins. Some are handmade by children, my sons or others. The pearly bead angel is a gift from a mom at the daycare center. The crocheted wreath is the thing I made one year to hand out hither and yon. This year I did up bookmarks, and there is a picture of those if you scroll down to a few days ago. The weather brought us two inches of snow this morning. I’m quite content being indoors and going blogging. I like your sweater…festive, and considerate. Very cool. I also have a hat like yours. It’s cozy, but slips upwards instead of over my eyes. Ugh. 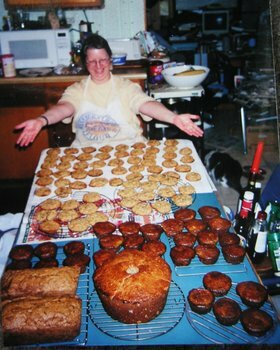 AND, look at all those baked goods. I would be in so much trouble sitting at that table! MMMMMMMMM holiday baking…good for you for doing your part to help others out! I can’t believe all of those cookies! I used to do that, too… but for some reason haven’t been able to get my act together the last couple of years. I LOVE the color of that green hat. I’ve just decided that it’s my favorite color. Nice stuff! Wow, that is some baking. I love your target Christmas sweater it looks very warm and cosy. Look out girl I got my rolled oats today and my shortening and margarine. I’ll be elbow deep in oatmeal cookies tomorrow! I hope to get a couple of more cake mix cookie recipes done too. I love the reindeer shirt. 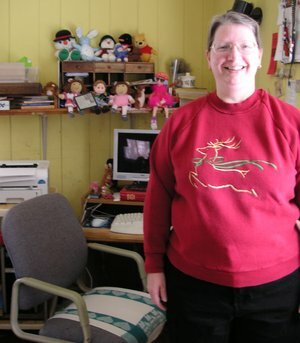 *tackle hug* I LOVE THE SWEATSHIRT! you look so happy! and are all those baked goods for MEEEEEE? oh you shouldn’t have…but I will be watching the mail just in case! Look at all those goodies! Yum!